This is what is believed to be an exhaustive list of Jeopardy! episodes which have finished with no winner, as all players either finished with $0 or missed Final Jeopardy. Click or tap the episode date for more information on the episode. This game is found in J! Archive. Greg Hopkins, the first champion in Jeopardy! history, was leading with $9,500. Lynne Crawford was in second at $5,000. Paul Schaffer had $1,100. All three inexplicably bet everything on the Final Jeopardy! category THE CALENDAR, and then wrote “What is January 1, 1900” to the clue “Calendar date with which the 20th century began” (the correct response: What was January 1, 1901?). Three new contestants played Episode 3. Less information is known about this episode. According to Robert Mcielwain, longtime fan and charter archivist at J! Archive, the returning champion was a 3-day champion named Ezra. 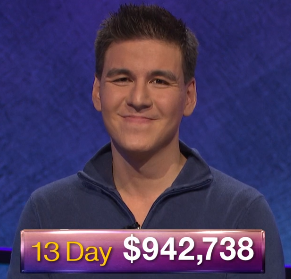 All three players finished with zero, and the next episode saw the debut of early 5-time champion Mike Day. This episode is not in J! Archive. Less information is known about this episode. According to Robert Mcielwain, longtime fan and charter archivist at J! Archive, this game also ended with three players at 0. Because it was a tournament quarterfinal, there was a fifth wildcard spot that opened up. This was a Celebrity Jeopardy game. All 3 players bet everything and zeroed out. (Naomi said “the Bill Cosby Show”, Teri “Seinfeld”, and Jane “Married With Children”). Player #3, Marion Arkin, finished with $-400 and missed Final Jeopardy. Robert Levy and Steve Sosnick finished the Double Jeopardy! round tied at $7,600. Both players guessed the League of Women Voters and wagered everything. Three new players played the next Monday. All 3 players guessed Dublin and zeroed out. As per the rules at the time, a wildcard to the finals was opened. However, due to the inherent unfairness of this, the rules have since changed, as reported by ToC players recently. A tournament semifinal with three players finishing at $0 will still produce a finalist. It is believed that in this situation (tournament semifinal), the finalist would be the player who was leading going into Final Jeopardy.